TasteeBQ is a superhero who shares short stories and recipe articles. He is on a mission to defeat the villainous BorenG'Food in pursuit of Making the World a Better Place to Eat. 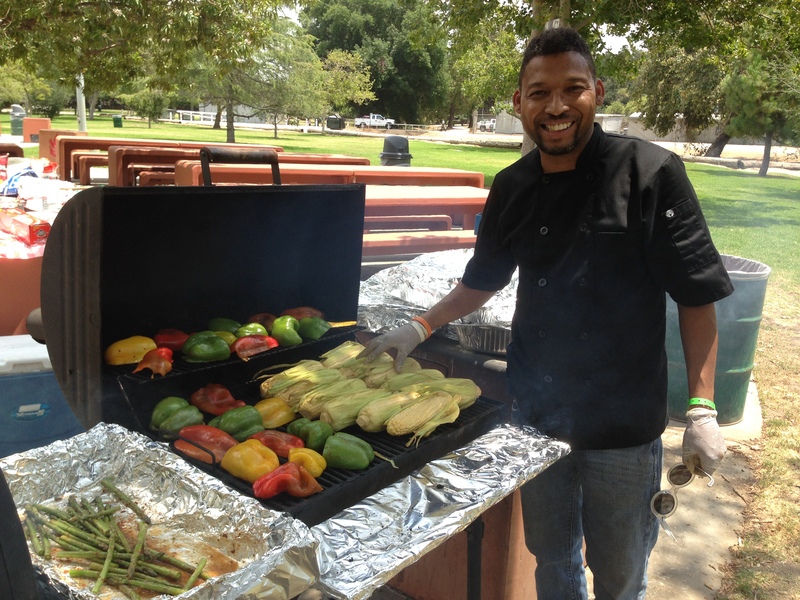 His day gigs include SpokesHero for BBQ Caterer- Tastee BQ Grilling Co. in Los Angeles and he is the iconic label model for the new California Gold BBQ Rubs (now available on Amazon.com). Blog creator Chef Mick Brown also writes BBQ Catering Confidential on Wordpress. He recently won Champion Grill Master on the "Grill or Be Grilled" Episode of Food Network's Cutthroat Kitchen. His newest project is "BBQ RESCUES! "- an interactive blog about Grilling and Recipes. There are also plans for BBQ RESCUES! Videos and Podcasts in the near future. 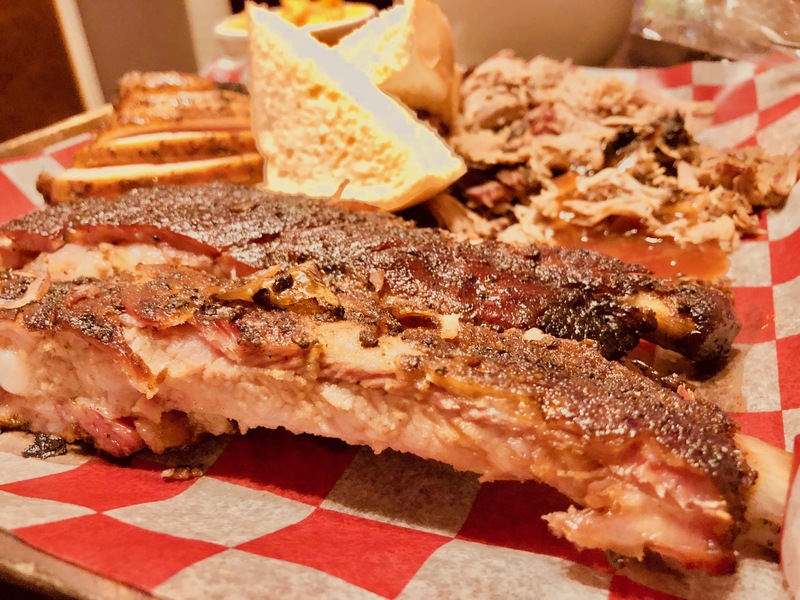 Can People With Food Allergies Eat BBQ? Dr. Ruchi Gupta, MD and Chef Elizabeth Falkner presenting Addressing Food Allergies seminar at 2018 World Food Championships in Orange Beach, AL. As long as you are not allergic to meat or fresh vegetables, there is no reason a person with allergies cannot eat BBQ. The important thing is to be conscious of all ingredients being used, and to guard against cross contamination. While judging my first World Food Championships last week, I got to attend a seminar called Addressing Allergies in Food Service. It was a half day program including experts: Dr. Ruchi Gupta, MD and Celebrity Chef Elizabeth Falkner (of Food Network’s Next Iron Chef and Bravo TV’s Top Chef Masters fame). The seminar was skillfully moderated by Tonya Winders, President & CEO of Allergy & Asthma Network. Chef Elizabeth Falkner prepares Allergy Friendly Menu at 2018 World Food Championships. Of course the highlight was tasting food made by Chef Falkner, who is also known for her famous San Fransisco restaurant Citizen Cake. It was one of my favorite go-to places whenever I visited the city (the Short Ribs were amazing). Unfortunately they closed in 2012, when the chef relocated to New York City. While preparing two dishes (plus dessert), Dr. Gupta, Chef Falkner and Tonya Winders gave us the scoop on cooking for people with Food Allergies. Chef Mick Brown of BBQ RESCUES! Foundation attends Food Allergy seminar with Dr. Ruchi Gupta, MD at 2018 World Food Championships. Chef Mick Brown of BBQ RESCUES! Foundation meets Chef Elizabeth Falkner at Food Allergy seminar at 2018 World Food Championships. Yes, they kind enough to do Photo Ops, upon request. Other common allergens include Chocolate, Mustard Seed, Sesame, Citrus, Onion/Garlic and Sulfites. Allergy Friendly Gluten Free Roasted Pumpkin Gnocchi with a Chia Herb Pesto and Zesty Roasted Pumpkin Seeds prepared by Chef Elizabeth Falkner. Light and Delicious. Most of us are fortunate to live without food allergies. However, people with allergies suffer from anaphylaxis, a condition that can go from causing discomfort to life threatening reactions. They depend on having Epinephrine available to combat these reactions. So if you are cooking anything, including BBQ, for someone with an allergy, please take it very seriously. To be safe, it is best to make everything from scratch instead of using processed foods- that can be manufactured in facilities with Nuts or Wheat. If you must use prepared foods, be sure to read the label carefully. Collard Green Enchiladas Salad with Corn, Black Beans and Rice prepared by Chef Elizabeth Falkner at the 2018 World Food Championships. Sadly, some restaurants and other eateries will not accommodate those with allergies. They think allergic people are just picky eaters. Moderator Winders shared the sad story of she and her young daughter being kicked out of a restaurant that refused to alter their menu. If you are cooking for those with allergies, be sure to determine how sensitive they are to certain foods. For example, many Pizza places offer Gluten Free crusts, but there’s regular flour all over the place. Someone with severe Celiac disease would be wise to take a pass. Chef Elizabeth Falkner’s Dairy Free Chocolate Flax Seed Mousse with Carob/Mesquite Streusel at 2018 World Food Championships. Chef Falkner’s menu for the day included Gluten Free Roasted Pumpkin Gnocchi with a Chia Herb Pesto and Zesty Roasted Pumpkin Seeds. It was light and delicious. She also made a salad with components of her Collard Green Enchiladas dish. The original recipe uses whole Collard leaves as a substitute for Tortillas, but only chopped leaves were available that day. For dessert, the chef prepared a Chocolate Flax Seed Mousse with Carob/Mesquite Streusel. She somehow made the preparation of these Iron Chef worthy dishes look simple. It takes just two words to elicit laughter from some BBQ folks: vegan BBQ. That’s the reaction Chef Mick Brown sometimes gets when he explains his passion for promoting vegan, vegetarian and healthier BBQ food. It is hard for some in the meat-centric trade of barbecue to conceptualize an outdoor cook without a single bite of steak or heaping pile of pulled pork. To many, BBQ means meat, but Mick wants to challenge that notion; he believes eating veggies can save your life. Mick is passionate proponent of getting people to eat healthier, and explaining the benefits of a vegetable-focused BBQ diet is a mission that drove him to found the nonprofit BBQ Rescues! and its website/blog www.bbqrescues.com. 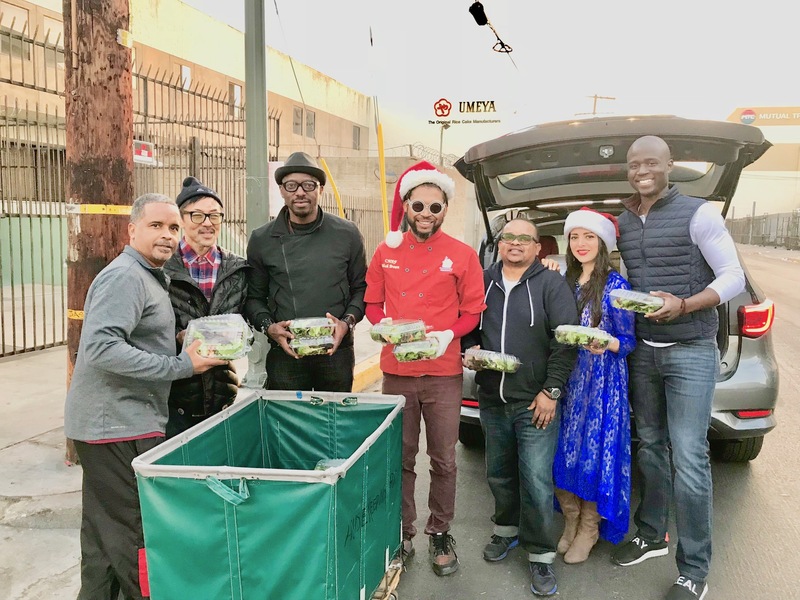 This past Christmas Eve, Mick helped serve fresh salads with L.A. Mission to homeless in the Skid Row area of Los Angeles. As a diabetic whose weight has fluctuated, Mick finds motivation to help others from his own health struggles. Mick is challenging BBQ restaurants and caterers to add a healthier — not fried — vegetable or vegan option to their menus by 2020 as part of his recent #BBQProject2020 campaign. Using the #BBQProject2020 hashtag on social media is meant to let others know the establishment has made a stride to make their menu healthier. The chef was part of a presentation during the NBBQA’s 2018 I Am BBQ Conference called “Making BBQ Healthy and Authentic.” After he grilled up some vegan BBQ for attendees, the extras were served with lunch that day. The crowd devoured them. Though you might not personally know anybody serving “vegan BBQ,” there are a restaurants and food carts around the country doing just that. In Portland, Ore., home to a number of vegan-friendly restaurants, there’s Homegrown Smokers which is getting local acclaim for their “tempeh ribs” and smoked “soy curls.” There’s even a vegan BBQ place smack-dab in the center of a celebrated BBQ Mecca. BBQ Revolution in Austin, Texas, makes their “No Bull Brisket” from a “wheat roast” that includes peanut butter. You might have already heard of the meat-free “Impossible Burger” which has been getting lots of attention for tasting — as some people proclaim — just like meat. The patty is made of wheat and potato proteins. As word has spread of his healthy, but still flavorful, vegan barbecue and cuisine, Mick got invites to cook for all sorts of celebrities, including catering a “Vegan BBQ Thanksgiving” for musician Redfoo, best known for his mega-hit “Party Rock Anthem” with his group LMFAO. For that meal he served a smoked sweet potato/carrot mash with fresh mint and a mix of smoked greens. Mick was also crowned Grill Master Champion on an episode of the Food Network show “Cutthroat Kitchen,” hosted by Alton Brown, a culinary idol of his. Alton Brown, a master of cooking meat and all sorts of foods, penned an article for Wired magazine on “the end of meat as we know it.” In that 2013 story, Brown explains that the future will likely be much less meat-centric, due to overpopulation and evolving food culture. There’s all sorts of science food being cooked up to mimic the tastes, smells and physical sensations of actual meat, he reported. “Meat is largely water. But when we taste it, we’re mostly sensing fat and protein. Proteins are simply long chains of amino acids,” he said in the article. “Plants build aminos as well, but carnivores love meat so much because its proteins — unlike plants — are relatively easy to access and digest (once you catch the animal). What’s more, meat gives us all the “essential” amino acids our bodies can’t produce, a trick that almost no plant can pull off, which is why vegetarians must carefully combine foods — like nuts and grains — to stay well nourished. Even with the option to mimic meat using plant protein, Alton Brown concludes, he’s not ready to shutter the butcher shops. “Plenty of people live just fine on veggies and grains. We could just lay off the real meat, right? Not bloody likely,” he wrote.